Staying at the Annerley Motor Inn guests can explore Brisbane's art scene, local landmarks, beautiful parks and much more. The property is conveniently situated just 6 kms from the Brisbane CBD. It provides fantastic accommodation offering affordable prices on a selection of motel rooms, close to all of the sight seeing attractions around the city. If you want value for money hotel accommodation in Brisbane then the Annerley Motor Inn and Apartments is the ideal place for you. This budget hotel features a variety of rooms that are designed for all types of travellers as well as great amenities like faxing facilities, free car parking, guest laundry, room service, outdoor swimming pool, tour desk, bbq and daily housekeeping. This Brisbane hotels consists of fully refurbished units or apartments which reflect Brisbane's tropical atmosphere. The Annerley Motor Inn is located only 6kms from the Brisbane CBD and is amongst the best motel style accommodation found in Brisbane. Brisbane offers something for everyone. You can explore Brisbane's art scene, local landmarks, beautiful parks and much more. .
Deluxe Double Motel Room : Sleeps up to 3 guests on 1 Double Bed. 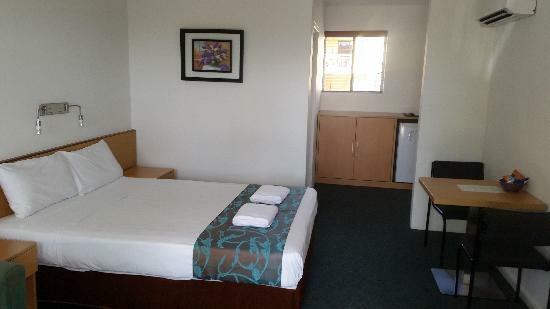 Deluxe Twin Motel Room : Sleeps up to 3 guests on 1 Double Bed & 1 Single Bed.